If you need assistance or have any questions while setting up goals, please reach out to our support team at [email protected]. We are always happy to help you increase the productivity of your Dynamics 365 environment! Functioning in the U.S. economy using cash only can be a challenge. Simple daily transactions, such as making an online purchase, going out to eat, or even paying a bridge toll is a lot easier if you have a credit or debit card. Most people know that having a higher credit score is a positive thing as it can help increase access to credit at more attractive rates. Additionally, most people also understand that not paying your bills on time, carrying a high amount of credit debt, and opening up a lot of credit in a short period of time are behaviors that will likely have a negative impact on their credit scores. What’s less intuitive is knowing what potential actions they could take to reach a target credit score goal by a target date. 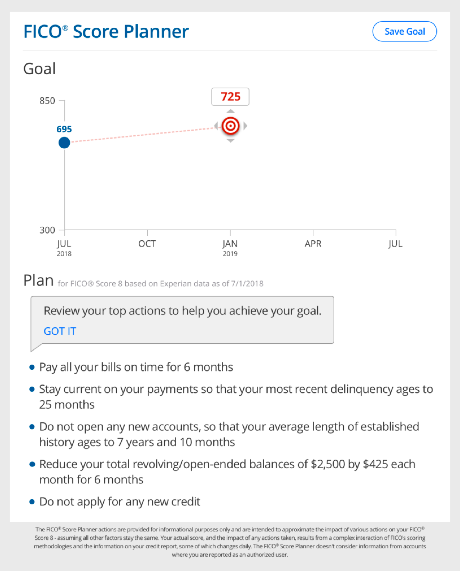 For example, if someone currently has a 695 FICO® Score 8 based on Experian data and want to increase that score to 725 in 6 months so they can apply for a new credit card, how would they know if that target score was even possible or what actions could be taken to potentially achieve it? FICO® Score Planner is a new feature built by FICO scientists that enables an individual to set a target FICO® Score 8 goal and desired time duration to reach their goal. These inputs along with an individual’s current FICO® Score 8 and credit report are analyzed by the FICO® Score Planner algorithm, which produces a set of potential actions consumers could take to help reach their target goal. Consumers can then track their progress to their goal or modify their goals along their way. Ideal for people with an active credit profile, FICO® Score Planner helps take away some of the guess work many people face when trying to figure out potential actions they can take that may help to achieve their FICO Score goals. Syncsort’s recent acquisition of Metron has put a spotlight on Capacity Management and the capabilities provided by the athene® software solution. But what, exactly, is Capacity Management, and why is it important? For over 30 years, athene® has been a leading solution for implementing, automating, and managing a mature cross-platform Capacity Management process. Syncsort’s acquisition of Metron ensures that athene® will continue to provide for legacy platforms, such as System z and IBM i as well as provide valuable support for newer technologies and platforms, including Cloud environments. One way for organizations to evaluate their Capacity Management process is to complete our Maturity Survey. Answer 20 quick questions about your organization and its processes, and you’ll immediately receive an initial maturity level as well as a comprehensive report with suggestions on how to improve your maturity. Sometimes it is not what the application was designed to do, but how the application is applied to a particular situation that the real benefits are realized. A large hedge fund was looking for a single system to accomplish some very specific goals. They looked at several point solutions for the financial services industry, but all required some integration with other systems. They looked at ERP solutions, but these were too generalized without customization. The firm also needed a new CRM solution and chose Microsoft Dynamics CRM for handling client data and interactions. When they saw a Financial Services solution was available built on Microsoft Dynamics CRM, they realized that a single platform could be used to handle all their customer relationship management along with the other goals of the organization without trying integrate multiple software systems. 1. Manage all investor and contact information, including forms and agreements. 2. Create a repeatable, end-to-end process for transaction processing—from initiation by the client to final settlement and cash movement—all at low risk to the firm or the client. 3. Create workflows that allow for multiple levels of controls and sign-offs, increasing efficiency while lowering risk. 4. Track financial transactions for audit purposes. 5. Manage complex, high-volume reporting requirements. Also, because the system integrated with the firm’s back-end accounting system, all investor transactions originated in CRM were automatically transferred. The move achieved a reduction in cost and easier integration because only one software solution was purchased and implemented. Find out more about how this firm utilized Dynamics CRM as both a sales tool and as a powerful operational platform with Green Beacon’s Financial Services Solutions for Microsoft Dynamics CRM. Successful sales professionals are often very busy attracting new prospects, strengthening ties with existing customers, managing leads, and closing sales. Each task is important and requires their close attention to detail. However, your sales team can be distracted by the paperwork or specialty business software and can lose focus on the big picture. Arm your sales team with a tool that streamlines the entire sales process and improves the customer experience. Improving the user experience: Specialty software, spreadsheets, and manual processes waste valuable time. Microsoft Dynamics CRM can capture the data you need with greater efficiency and put it into a usable, insightful context. Lead scoring: Not every lead requires the same level of dedication. Use Microsoft Dynamics CRM to score leads and assign key sales representatives to customers that ready to buy while utilizing your marketing team to nurture prospects that aren’t quite ready to make a decision. Taking a proactive approach: Don’t wait for customers to place a call, use the business intelligence features to predict buying behaviors and reach out to your customers. Taking a proactive stance can improve both sales and customer service as well as generate long-term loyalty. Multi-channel services: In this digital era, there are many ways to communicate with prospects and customers. Connect with customers on their terms, whether it’s by phone, email, on preferred social media sites, or instant messaging. Harness business intelligence: With all of your marketing and sales data within Microsoft Dynamics CRM, you can use dashboards, business intelligence, and reporting to turn data into actionable insight. Streamline the entire sales process and provide your team with the tools to improve sales and strengthen customer relationships. Download our eBook and contact AbleBridge for more information about keeping your sales and marketing team focused on their goals with the support of Microsoft Dynamics CRM. Are You Pulling Teeth To Reach Goals? Your organization’s yearly goals surpass the company standards, but is it working? Sometimes we become so captivated in the process of building a training program that we forget to keep tabs on what’s working and what isn’t from employee to employee. Growth is an important aspect of any company – those that are high-growth organizations provide a 5 times greater return to shareholders than medium-growth companies. What steps do companies need to take in order to reach (and sustain) upper-level success? How can we better manage our end goals? The training program is in place; what follows? Ask team members to track their own progress, whether it’s weekly deliverables via spreadsheets or sharing accomplishments through tools like Basecamp. This allows employees to take control of their own development so you can manage them without micromanaging. Requiring employees to display what they have done in a week can be an eye-opener and a motivator. Online documentation is also a helpful way to track progress when reviews come around. When they physically type their accomplishments they see what changes need to be made in the future and what goals need to be reassessed for following weeks. Don’t be afraid to simply… ask! Give employees an opportunity to speak on what they need – what resources they lack or what they struggle with for example – allows the employer to step in and offer alternate routes. Believe it or not, employees want your feedback; 43% of highly engaged employees receive feedback from their employers at least once a week. Each employee learns and develops differently which means each employee will need customized paces and tasks for their daily work. Give them the opportunity to assess themselves to see if they have hit personal goals or taken a role in completing organizational goals. At this point, the supervisor and employee can brainstorm new goals if past initiatives exceeded (or didn’t meet) expectations, or even find more effective tactics meet goals. This way, both have a solid understanding of short and long-term goals for that employee. It’s important to set reasonable goals for your employees that both parties agree on. Creating comfortable, open relationships between employee and employer, discussing professional goals, requesting weekly deliverables and monitoring trends throughout your company are all steps that can easily be implemented into every company for reaching the highest potential goals. Reaching goals within a team can be a three-step process: Define, execute and trace. See if what you’re completing is matching your predetermined goals and reassess as needed. For more performance strategies that get results, see 7 Reasons Performance Management Fails And How To Fix Them. The post Are You Pulling Teeth to Reach Goals? appeared first on TalentCulture. Yes, new technologies have changed the face of marketing over recent years (and wildly expanded the possibilities). But regardless of the new tools available to us, essential marketing strategies are still the same whether the tactic is traditional or digital. Our ability to attract, capture, nurture, convert and expand our customer base still relies on our ability to set, implement, and track marketing goals. Goal setting is a powerful process that helps you define and refine your thoughts and get motivated to turn vision into success. Without goals, we often lack direction and focus. But in order to reach your goals, either personally or professionally, you need to know first how to choose them, and then how to set them. You’ve probably already heard of the term “SMART goals.” “SMART” is a mnemonic device (pronounced nəˈmänik); mnemonic devices are simply patterns of letters, ideas, or associations that assist people to remember something. SMART is the mnemonic for remembering a particularly effective system for goal setting. This approach helps you define tactics that can potentially help you raise your marketing game to a higher level. Who: Who are we trying to reach, or who is involved? What: What, exactly, do we want to accomplish? Do we want more conversions, opens, clicks, likes, sales, etc.? Is there a specific number attached? Why: Why do we want to accomplish this goal? What business objective will it support? Where: Where are we going to do this? In online marketing, this may refer to targeting a specific platform or channel such as email, web, YouTube, etc. When: When do we expect to accomplish this goal? Set a specific timeframe for achieving the goal. How do we know if our efforts are successful if we don’t measure our results? Goal-setting without measurement would be like having a sporting event without keeping score. High performance marketers typically live and breathe by powerful analytics tools and technologies that quantify conversions. Measuring your success isn’t hard; just make use of the potent analytic tools available today. These measured results tell you what is working and can show off the marketing team’s effect on lead generation, lead nurturing, and ultimately revenue. It would be highly frustrating to set a goal that is unattainable or unachievable. Historical marketing analytics and data can help define what’s possible and practical. Be careful here, as setting a goal that’s too easily attained can be detrimental as well. If it’s too simple to achieve, it will be anticlimactic (at best) and not provide any sense of real accomplishment. This can be demoralizing for you and for your team. Set goals that are realistic but do require you to raise the bar. Achieving goals that make you stretch a little will bring the greatest satisfaction. The more you practice, the better you’ll become at striking that fine balance between determining which goals will be both attainable and challenging. If you set a goal that’s relevant to the success of your company and your team, you’re more likely to get that all-important buy in. When execs know you’re working to achieve a business objective they hold dear, you’re more likely to get budget. When team members know you’re working on something that will help them meet the objectives they are responsible for, they’re more likely to pitch in. Everyone is more motivated. Your goal also has to be realistic. If your statistics tell you that a 3% quarterly increase is average growth in a particular area of your marketing, shooting for growth of 4 or 5% might be more reasonable than trying to double it to 6% out of the gate. Run the numbers to see how a goal might actually work out extrapolated over time. A change from 3 to 4% doesn’t sound like much … but this expectation is actually 33% higher than average growth, and if the rate holds steady would account for 213% growth over four quarters. Shooting for the moon, while optimistic, can just set you up for failure, which in turn discourages future progress and attempts at success. It’s vitally important that each goal has a deadline, target, or completion date. This can help set team priorities, and a sense of urgency. No timeline = no sense of urgency. This timeline should also be realistic and attainable. Having a set timetable lets you track progress at key points, which may reveal the need for adjustments (in strategy or timing) along the way. A target date provides the perfect opportunity to set a date on your calendar when you can celebrate your success in achieving your goal – cake for everyone! Write down your goal/objective. Make sure it is SMART. What are the steps that need to be taken to succeed? Identify the responsibilities needed to accomplish the task. Analyze and delegate the tasks and determine who will be responsible for each piece of the puzzle. Monitor your success: Determine specific increments along the timeline to check that you are making progress towards your ultimate goal. If this is a type of project you do repeatedly, see how this timeline compares with ones in the past. Do you want to lift your email response by 10%? Create three personas, and then use them in a three-step email campaign to 20,000 names. Is brand awareness on your radar? Then be thinking about content creation, organization, re-purposing, etc. How many thought leadership pieces will you create? Where will you distribute them? Do you want to grow your marketing list organically, by 15%? Think about what people can opt-in to: Newsletters, RSS feeds, etc. Do you need to generate 10,000 new leads? Then be thinking about how you can use forms to get information, and the download bait that you need. How many eBooks, whitepapers, etc.? 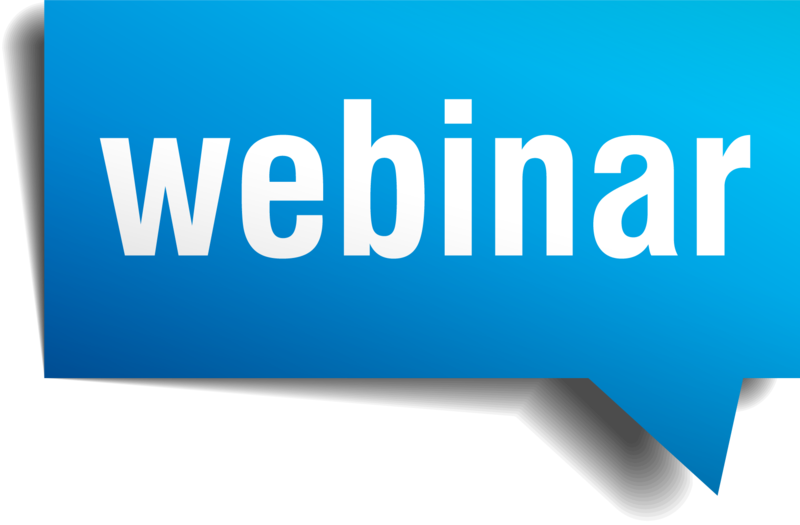 What about webinars (you can get away with more questions on a registration form)? And how many downloads will you need to get one good conversion? Setting too many goals can be overwhelming for both an individual and for a team. One or two will turn out to be more complicated than you expect, so plan for that and keep the number manageable. Now that you’ve set your SMART goals, get motivated and follow them through to realization. Write your goals down, send them to all stakeholders, post them on a wall in the conference room – you get the idea. Periodically review your objectives and make any adjustments that are necessary. It’s perfectly acceptable to repeat a goal if the desired results weren’t achieved in the first go-around. With some slight modifications, the next time will surely be a triumph! Get excited about your pending achievements, incite your team’s enthusiasm, and gain momentum to hit your targets. Getting your goals right to begin with is a SMART start to a successful program. A high-performance marketing plan can help you understand how your programs are doing, understand their impact on revenue, and can help your team become more efficient. Get started on your plan today with our eBook, “The High Performance Marketing Plan,” and learn the six-step blueprint for developing a high-performance marketing plan.